Today, as most of you are aware, is Memorial Day in the US. Many towns have a parade on Memorial Day, but not us. Our parade was last week Saturday, on Armed Forces Day. From what I understand, the two holidays are very similar. I think Memorial Day is more to honor those who have given their lives in service. I’m not really sure why we have our parade on Armed Forces Day instead of Memorial Day. 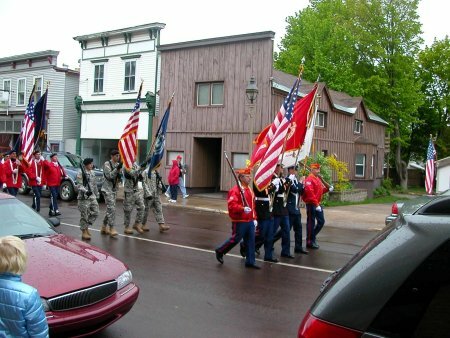 Originally I thought it was so those involved in the parade here could attend another parade on Memorial Day, but looking at some of the local area events pages doesn’t turn up any Memorial Day parades in the area. Memorial Day is a nationally observed holiday in the US, so many businesses (at least the small less important ones) and all government associated shops get the day off. Of course, this means MTU has the day off and I don’t have to work or go to classes. Today it was beautiful outside (much unlike the parade last week Saturday) so I took the opportunity to put my bicycle back together and take it for a spin. I ended up biking out to McLain State Park. It’s about 10 miles away from my apartment, and makes for a nice ride. When I get there I can walk along the beach and go swimming. I didn’t do any swimming today — it seems a little too cold yet for me to hop in lake Superior — but I did see one person out there cooling off. On the ride back from the park it became apparent that I have spent way too much time driving and not enough time on my bike. I was completely exhausted by the time I made it back home. Need to start biking to work/school from now on. Saves me gas money and helps me to get in better shape. This entry was posted on Monday, May 28th, 2007 at 10:07 pm	and is filed under Life. You can follow any responses to this entry through the RSS 2.0 feed. You can leave a response, or trackback from your own site.